February’s Grid Alive might have seen a change in venue for our loyal audience members, but we still brought the same fun, enlightenment and humor to the stage as always. On Feb. 18, our inimitable hosts, Grid publisher Alex Mulcahy and Head and the Hand founder Nic Esposito took the stage at the beautiful International House near the Drexel University campus, bringing their pun-tastic dad jokes with them. Our first guest was Maya Van Rossum, Delaware Riverkeeper of the Delaware Riverkeeper Network, featured in our February issue. A fierce defender of the Delaware River and its surrounding watershed, Van Rossum has been working tirelessly for years to advocate on behalf of one of our region’s most precious resources that is often taken for granted. Onstage, she spoke with Alex and Nic about some of the most immediate threats to the river, and what the public can do to be better stewards of this important environmental resource. She strongly encourages folks to be more involved in their local politics, express their environmental concerns to local leaders, and pay attention to proposed legislation that may harm the river’s health. Up next was Rachel Ford, founder of Made Studio in Old City, which was our March cover story. As a former costume designer for the Philadelphia Opera, Ford opened Made as a place where students of all experience levels can take classes on garment making and design. She spoke to Nic and Alex about the renewed interest in small-scale garment manufacturing in Philadelphia, and how emerging designers and recent grads are taking advantage of Philadelphia’s entrepreneurial spirit to push their fashion careers forward. She was most excited to share about her ongoing project working with Burmese women living in South Philly. With a lot of translating and teaching through miming, Ford says she and her team at Made have trained over 40 women in sewing skills as part of the Philadelphia Burmese Women’s Initiative. You can read more about the program in our March issue. Our final guest for the evening was a familiar face to Grid Alive. 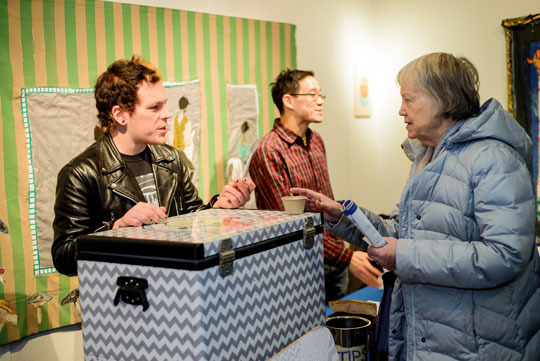 Pete Angevine, co-founder of Little Baby’s Ice Cream, has been a part of our live events for a while now, bringing samples of their ever bizarre and delicious ice-cream flavors for audience members to enjoy. Angevine told the audience about his unusual path to becoming an ice-cream man, beginning as a student of jazz performance at Temple University. He related much of the creativity that music affords him to the creative liberties and risks they take with their flavors at Little Baby’s. As always, beer and wine from local breweries and vineyards were graciously provided by Rolling Barrel Events, as well as a luscious cheese spread. Representatives from our event sponsors, Mariposa Food Co-op and the Penn Master of Environmental Studies, were on hand to answer questions before our guests took the stage, as well. And of course, more ice-cream samples courtesy of Little Baby’s, although the supply ran out before the show even started. Bummed you missed out on the fun? We’re sad we missed you, too. Be sure to join us at our next event 7 p.m. April 17 at the Oval.